King Henry II of England ruled in the 12th century from Ireland to the Pyrenees, was warlike, given to anger, and was educated in law and languages. He was the first king of the Plantagenet dynasty and brought a new level of organization to the English government. Henry II was also the first to establish an English presence in Ireland , a move that led to much trouble and violence there through the 20th century. Furthermore, his disputes with his sons and his adultery marred his family life and reign. When was Henry II Born? Henry was born in France in 1133. He was king of England from 1154 to 1189, spending just 14 years in aggregate on English soil. His parents were Geoffrey Plantagenet, Count of Anjou, and Matilda, the daughter of Henry I of England. She was known as the Empress because of her first marriage to the Holy Roman Emperor. The great-grandson of William the Conqueror on his mother’s side, Henry became king at age 21 upon the death of King Stephen. The new king quickly and energetically set about restoring law and order in England. To start, he ordered that all of the illegal castles erected under King Stephen’s anarchic rule be demolished. 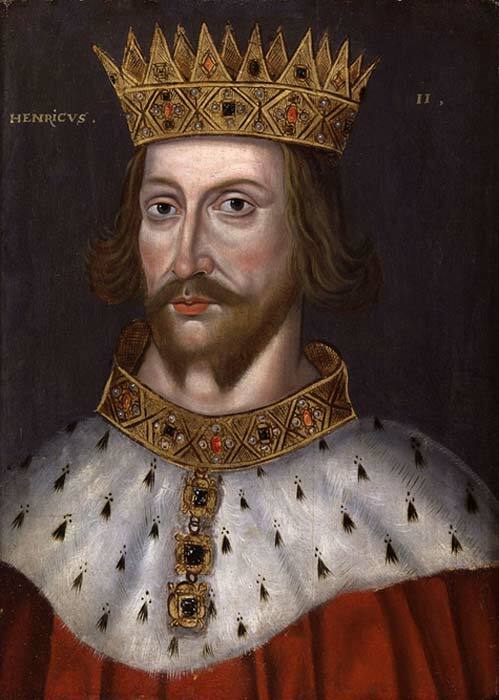 Overall, Henry II was important because he was a careful administrator and he overhauled the English judicial system. The nickname of Henry’s father, Geoffrey “Plantagenet,” came from a sprig of the Planta Genista bloom that he liked to wear in his helmet. This gave rise to the name of one of England’s dynasties. The Plantagenets ruled England for the duration of the Medieval era , though they did not take Plantagenet as their surname until the mid-15th century. From his father, Henry inherited the counties of Anjou and Maine and the duchy of Normandy in France. 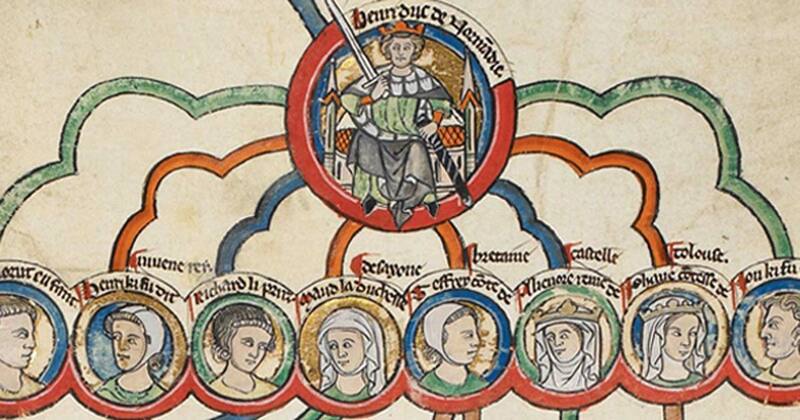 He married Eleanor of Aquitaine, adding Aquitaine and Poitou to his lands. He owned more French lands than the king of France himself. Eleanor was 11 years Henry’s senior. They both were strong of character and were used to getting their way. They had a tempestuous marriage. Eleanor was said to be remarkable for her beauty, intelligence, and refined culture and was celebrated by troubadours in Aquitaine. She was one of the great women of her time. Even so, Henry was a serial adulterer. When he entered his illegitimate son Geoffrey, born of a prostitute, to the royal nursery, Eleanor was angry and felt insulted. The couple’s rocky relationship was irredeemably ruined. Henry’s reign was marked by disputes with his chancellor, Thomas à Beckett. Henry hoped to gain control of the church legal system, but Thomas, who was also archbishop of Canterbury, strove to thwart him. The discord between the two powerful men continued for years. At one point, Thomas fled England. Finally, the story goes, Henry said, “Will no one rid me of this turbulent priest?” Four knights rode to Canterbury, called Thomas a traitor and tried to drag him outside. Thomas refused to go and said, “No traitor but a priest of God.” The knights struck him on the head with their swords. He fell to the floor of the cathedral, dead. The scandal created a buzz in Europe. Henry’s rage turned to grief and England was threatened with excommunication. Henry did public penance by walking barefoot into Canterbury Cathedral, where monks scourged him. Henry and his wife Eleanor had many children. The boys would grow into a quarrelsome group, finally coming together to challenge Henry militarily near the end of his life. The disputes involved his sons Henry the Young King, Richard, Geoffrey, and John, who received lands and castles before Henry. Young Henry was dissatisfied and challenged the king. The king of France, young Henry’s father-in-law, led him on. Henry’s wife, Eleanor, was caught, dressed as a man, trying to flee to her sons in France. Henry imprisoned her for 10 years. Their relationship had deteriorated further because of Henry’s affair with Rosamund Clifford, mother of two of his illegitimate sons. People believed Henry genuinely loved Rosamund. The power plays between King Phillip Augustus of France, Henry, and Henry’s sons continued as the French king tried to retake his lands from the Plantagenets. Henry, advancing in age, fell ill at Le Mans, where he was born. His son Richard and Phillip Augustus attacked him there, and Henry was forced to flee. At Tours, Henry was forced into a humiliating deal in which he accepted all of his son Richard’s terms. He became deathly ill and went to Chinon, where he found that his most beloved son, John, had joined the traitors. Henry had a perforated ulcer and hung on, semi-conscious, until July 6, 1189. His last words were “Shame, shame on a conquered king.” He was succeeded by Richard I, his oldest surviving son.